Poster put up in Foyles bookshop, 2009. Foyles is the grand-daddy of independent bookshops and was a hugely positive part of the Fudebakudo book’s timeline. 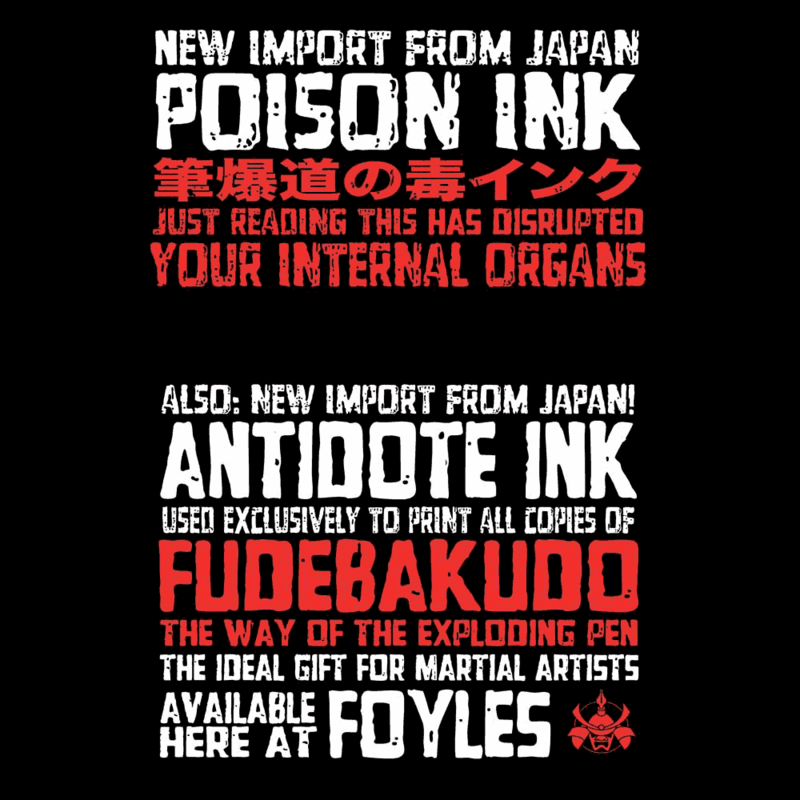 The Foyles people were the champion sellers for Fudebakudo the year after it launched (becoming, I was told, the best-selling title in the Sports Section in 2004 at Christmas — a claim that narrows in its telling, I know, but still a good one to have). They always were charmingly chaotic and back in the day the martial arts section of their famous shop on Charing Cross Road was the biggest and best in London (maybe that doesn’t count for much because it’s such a small market; on the other hand, if you want to sell books in bulk you end up like WHSmith, or Tescos and have no business appealing to niches). Furthermore — and crucially for a small publisher like Exploding Pen — back in 2003 the staff on the floor, who knew and understood the books and the shelves and the public that could be found in their specific departments — had the autonomy to make their own purchasing decisions, rather than floating them up to some distant head office pooh-bar, as was the wearisome case with most other booksellers. Since those times Foyles has expanded and they’ve lost their way a bit and along with it much (but not quite all) of their charm. Nonetheless, independent bookshops are to be treasured, so although it’s been many years since I was putting posters up on their walls, when I’m in London I try to drop in, to check they’re keeping the unsold copies of Fudebakudo nicely dusted, and to acknowledge their still well-meant greeting, the one that proclaims in neat, suspiciously-corporate lettering, “Welcome book lover, you are among friends”, and which I must duck under in order to get to that most overlooked and undervisited of shelves.